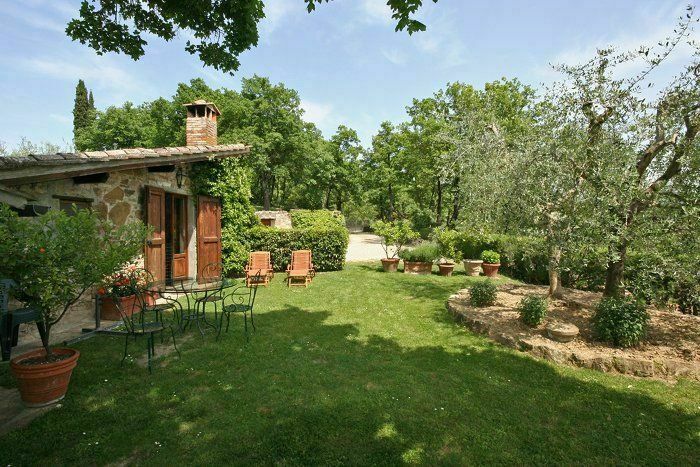 Charming former stone barn completely restored quietly situated on the Chianti Classico hills offering beautiful views over the surrounding vineyards. Distances: the centre of Greve in Chianti with all kinds of shops 3 km, Florence 25 km, Siena 45 km. At guests’ disposal: large and equipped garden, swimming-pool to be shared with the owners (16 x 9 m – maximum depth 2 m – open from 01/04 to 31/10), barbecue. Baby bed (free of charge). Parking within the grounds. The access to the property is via an unpaved but well-maintained road. Extra services: possibility of hiring an extra bed at € 100,- / per week payable locally. Maid service available by arrangement (to be paid on the spot). On request is possible to organize “Italian cooking classes” (minimum 4 persons) € 60,- / hour (dinner included). 90 m2. Ground floor: double bedroom with fireplace and access to the garden, dining room with kitchen corner (oven, freezer, microwave and access to the garden, passageway room with 2 single beds (TV sat), bathroom with bathtub and shower. Private and equipe outdoor area.